Percentage of residents in remote communities with a computer in 2011 . 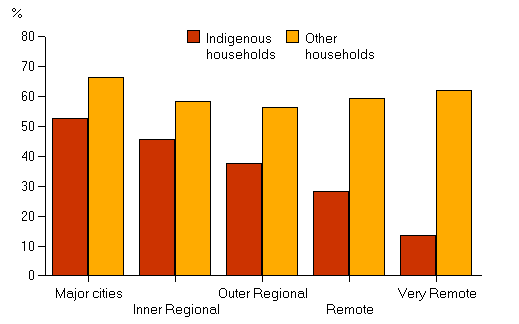 Percentage of Aboriginal households with Internet access in 2006; non-Aboriginal households: 64% . In 2011, 80% of all Australians accessed the Internet regularly, but just 6% of residents in some remote Aboriginal communities even had a computer . While Aboriginal people living in cities and regional towns usually enjoy good Internet access, in 2007 only 10% of rural or remote Aboriginal communities could access to the Internet . By 2015, they were still 69% less likely than non-Aboriginal people to have any internet connection, and half as likely to have broadband access. Access rates can vary greatly between communities. In some communities, as few as 2% of residents have an Internet connection. 58% had used a computer but a third of those had never been online. Internet access by remoteness area, Australian Bureau of Statistics, using census data from 2006 . Lacking infrastructure is one issue preventing more computer access, with many communities lacking generators for electric power. Three quarters of Internet users in remote areas were under 30, unsurprisingly, since about 33% of the Aboriginal population is of that age, compared to around 20% of non-Aboriginal Australians . Even if infrastructure reaches communities it might not solve Internet access problems. Once a household is connected people need to be trained up to use and configure a computer and modem. Matching the type and quality of technology to needs in consultation with Aboriginal communities goes a long way towards facilitating access . Literacy. Aboriginal people in remote communities have lower levels of literacy. Cost. With much less competition, equipment and maintenance costs are higher in remote areas. Inexperience. People have less technical experience and are shy (or too old) to learn. Vision. People have less motivation and appreciation of how they could benefit from the Internet. Poverty. Even if they received equipment for free some would not be able to afford the ongoing costs of an Internet connection (Aboriginal people have a higher proportion of mobile devices and connections than non-Aboriginal people). Poor health. Poor health reduces your willingness to use advanced technology. This digital divide exacerbates the social disadvantage experienced by many Aboriginal people, especially in regard to general health and wellbeing, education and job opportunities. Due to their geographical location, many communities don't have a broadband connection, wi-fi and, in some cases, even mobile phone reception,  severely limiting their access to information and the opportunities available through the Internet. Daniel Featherstone, General Manager of the Indigenous Remote Communications Association (IRCA), says smart devices spread faster than access. Internet banking Many Aboriginal people check their account balances often, but at ATMs, which incurs a fee. Internet access avoids these fees. Access to Aboriginal-specific resources. Apart from government agencies, Aboriginal people can access resources serving their needs, such as a place to keep digital cultural records , for example stories and local celebrations, including appropriate access protocols. Broadband technology can also help support job seekers in remote communities where mobile phone coverage is patchy at best. TAFE South Australia Regional offers small group sessions, self-paced training resources and an e-tutor for learning support . The National Broadband Network (NBN) will hopefully improve these statistics. But because of their isolation remote communities are likely to be connected to the NBN via satellites . While these provide download speeds of up to 12 Mbps (megabits per second), faster than many ADSL2+ connections now provided, upload speeds will stay at 1 Mbps, preventing real-time video streaming of content . In April 2008, six remote Western Australian Aboriginal communities close to the border to the Northern Territory and South Australia were connected to high-speed broadband via a fibre optic network . Previously communities had used satellite phone connections, which were very unreliable and unusable for clinics, for example. The broadband network enables people to do business from home instead of travelling hundreds of kilometres to Perth or Kalgoorlie. It also allows teleconferences with special doctors or in courtrooms, enabling people to attend court without leaving the community. Many Aboriginal people don't like leaving their communities for errands and business . The Indigenous Remote Communications Association (IRCA) based in Alice Springs is the peak body which represents and advocates for the media and communications interests of remote and very remote Aboriginal communities in Australia. Affordable service. Income is often a barrier to using digital services. Solutions need to be sustainable with a pricing structure matching local income levels. Community centres (such as libraries) provide wifi with appropriate support and at a concessional rate. Simple data plans. People need to be able to subscribe to affordable and simple data plans. Controlled data usage. Mobile apps should ideally have no data charges. Appropriate devices. Aboriginal people need the right phone for the right environment. A smartphone might not be necessary where a phone is used just for calls. Touch screen kiosks. Placed in central community areas in 70 Aboriginal communities across Australia, the kiosks allowed people to view curated content or download information from it onto their mobile device. This removed barriers for many people and enabled them to seek out information when it suited them. Poem by Jonathan Hill, Old Erowal Bay, NSW . Read more Aboriginal poetry.